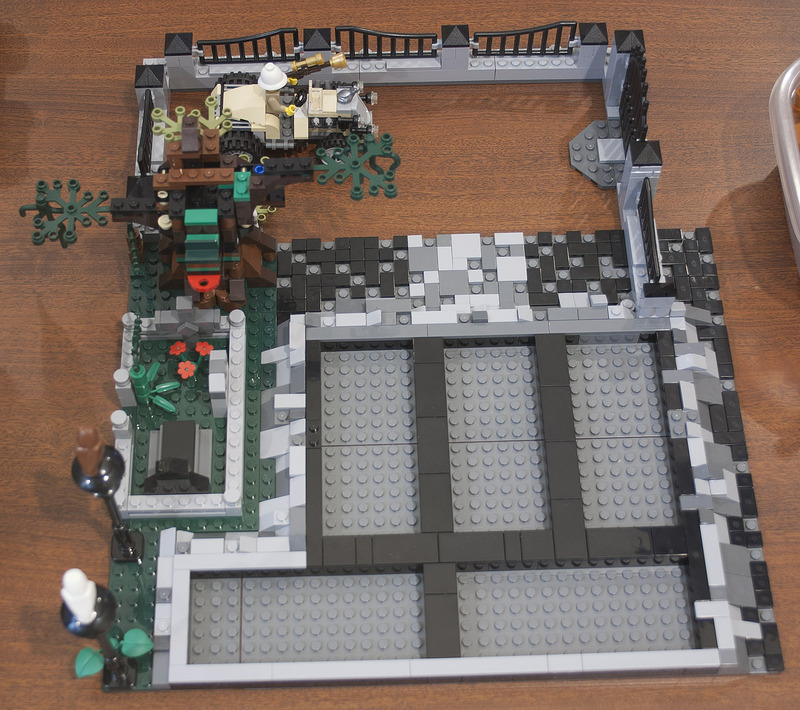 A special baseplate for the Haunted House! 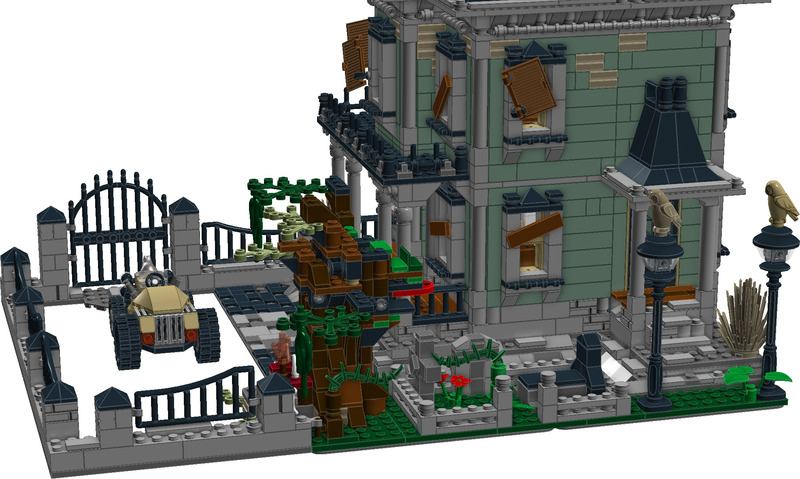 I have a masterplan for my modular buildings and it uses the haunted house (HH) along with the modular buildings (MB). 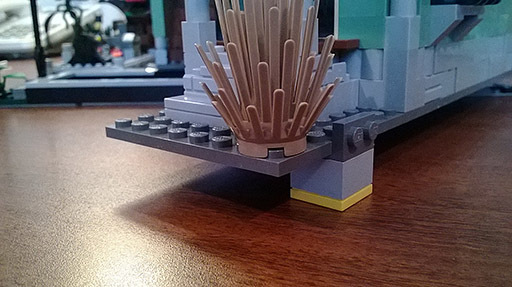 But the HH does not have a baseplate so it does not fit well. Also, it opens by swinging, differently from the MB - the HH is not modular!. So my solution was to place it on a corner (my layout is a mere row of the buildings, I don't have the space for something else) with a little gap between it and the next building and ... a baseplate that would allow the swinging! Being kind of a purist, I don't like to change a set, so what I did was to add stuff. The HH itself will be exactly as it is supposed to be, no modification except for the fence that was expanded. The HH will sit atop this base that I created (with a little help from my daughter). 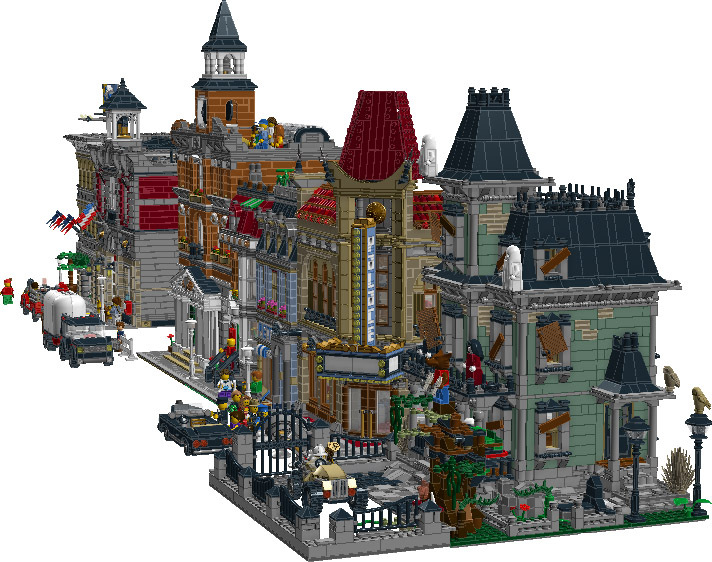 It was all created in LDD then later made into real bricks. I have two pictures only to show and the HH is not yet assembled. And please understand that I am an unexperienced mod'er/moc'er. 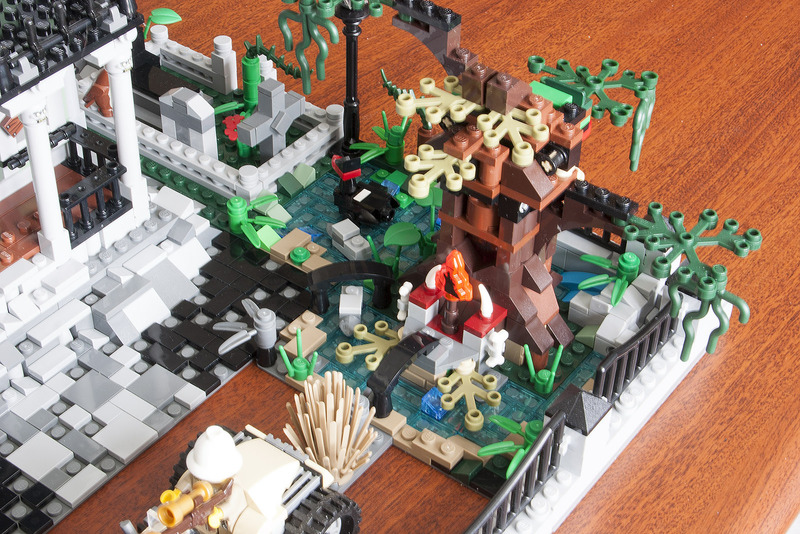 I started creating with Lego two months ago. Question: how do I put a thumbnail of a picture here so that when I click it it will open the full picture in another tab or window? Hmmm, interesting. I'd like to see how this turns out. 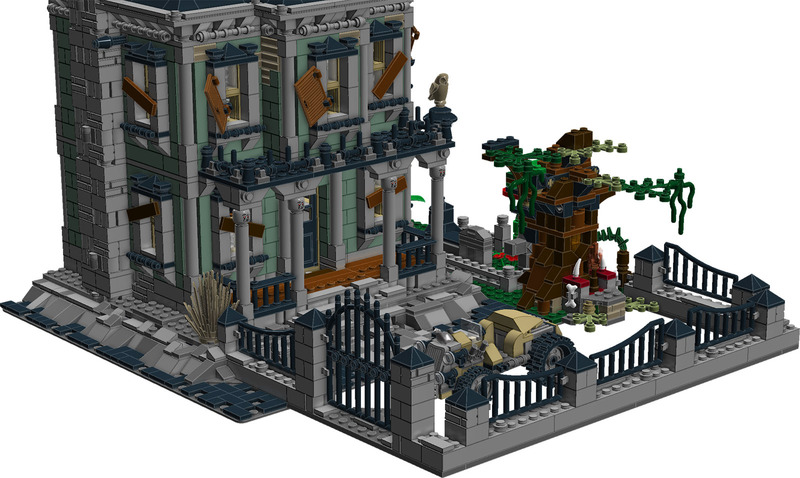 Current, my Haunted House is on a 32 x 32 baseplate. The front portion of the House is elevated on plates, while the back portion is on flat tiles. To the left of the house is a series of more flat tiles, so the house can swing out and rest without a problem. However, your solution looks much more aesthetic than mine. 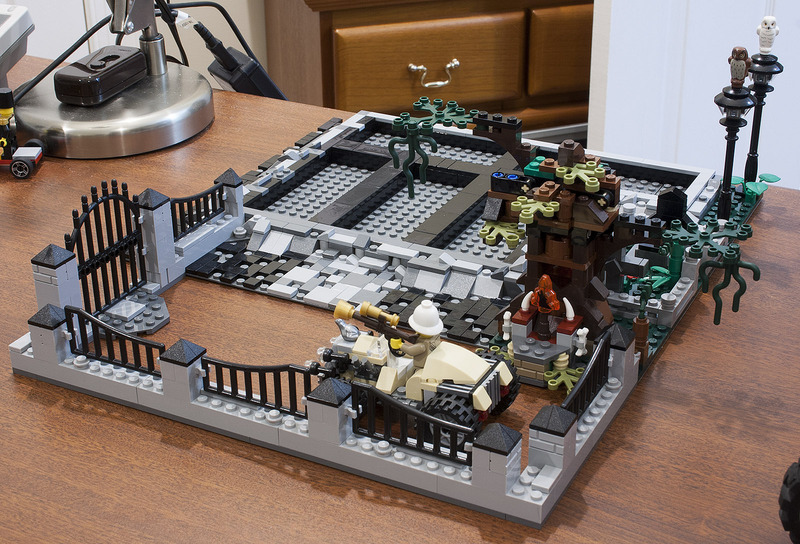 I like that a lot, didn't realize the HH was not on a baseplate as I haven't started building mine either, I too applaud your courage to do the baseplate before the house...I might have to steal your idea somewhat when I get around to getting it put together. Excellent base you have there. I can see the scary 'house on the hill' vibe from it. I'd like to do something along the same lines. Might as well throw some skeletons in that "basement" you've got there. Very cool base you have created there, I can't wait to the HH on top of it... I'm surprised you didn't make the base able to fit in with the modular standard tho...? Also, that would be a very creepy place to walk past, with a graveyard in it that's my favourite bit, as well as the rock work on the side. ... I'm surprised you didn't make the base able to fit in with the modular standard tho...? .. This house, with its extended area of 48x40, is the "last house at the end of the street" in my layout. The "street" is an area equivalent to 16 studs in front of all the modular buildings (that are a single row) where I can place some vehicles, etc, (but no baseplates are used, just like in front of the HH). The 8-stud wide extra area to the side of the HH exists because I just had this little bit of space left and it fit well with the idea of placing the HH on top of a small "hill". Here is a pic of my layout. I still have not added the Parisian Restaurant to its designated space. This is all the space I have, there is nothing left to expand. Oh, and also I needed to have the HH a little to the right to allow for the swinging (opening it), although this is only theoretical since I don't play and will not open it. Because I like the idea of the House Up the Hill, I found this solution. but I'm not such a good builder! it's part Lego 30271, you can find it online, used mostly. I have 2/3 of my HH built and I saw an unforeseen issue, as we were building it. The weight! I then have just now placed the 2/3-ready HH on top of my base to test it. It fit perfectly but my worry is that when the HH is on top of the base, when you swing the back half to open the house, all that weight could tip the house, since it sits on flat tiles with just four studs holding/positioning it in place. The good news is that it doesn't but then I saw another issue: when the back half is opened, its weight is supported basically only by the hinges in the chimney. When laying in a flat floor as designed, the weight would be distributed on the floor and the hinges are not under burden, but with the whole house suspended, the hinges have to hold a lot of extra weight and some strong "contortionist forces" (dunno how to say it better in English, sorry). I don't think they are designed for that. Right now, with 2/3 of the house ready, the hinges seem to hold it ok, but I can see the back half gets a little tilted due to its weight, when opened. By the way, my base does not allow the house to open 180 degrees. This is by design, since the room that I have between the HH and the neighboring building would not allow it anyway. To allow the 180 turn, you just need to remove a few 1x1 slopes. I will post a picture of the whole thing once the HH is completed. This is looking very interesting so far. Good luck! I finally finished this project! It was finished but then I decided to enhance it a little bit more so I added a swamp with muddy waters and a family of black swans into the landscape. The tree now is surrounded by the waters of the pond/swamp. This closes this chapter of my Lego addiction life. There are still two other chapters to close and then I will be done with Lego: one is the Ole Kirk's House (OKH), still not finished since I also decided to change a few things, and the other is connected to OKH, it is a vehicle for Mr. Ole, the Ford Model A Pickup. One thing that I still don't like much in this Haunted House is the tree - from the Werewolf set. I'd like to have a scary tree with no features, a more "pure" tree, but I am not going to change it. Enough with the HH. And here is the LXF file. It is as close to what I built as possible. Oh, and the black cat that you can see in the LXF file was an idea that I never implemented. Too expensive to buy that cat. And the dark bley 2x16 plate that holds the vehicle was just a way for me to use that plate that ended up as a spare part. Really nice mod but I don't think you should have it by the cinema. I have 71 inches of space for the modulars and no more. That means I need 7 of them. Since I don't and will never have the first 3, that leaves me with 6, so I am short of one. The HH came to the rescue. Also, the HH is green and I just love green, specially the greens that are not the regular basic Lego green (like the HH green or the Parisien Rest. green)! 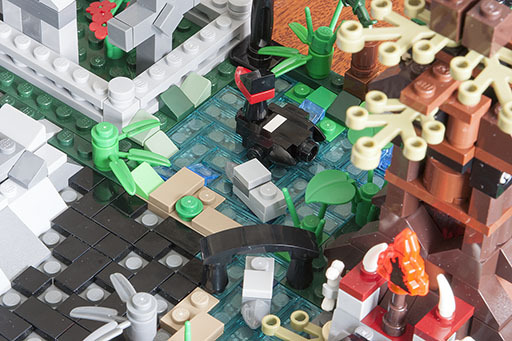 I was thinking that maybe, next year, when Lego releases the next modular, I can remove the HH from the row and have it alone some place else. The HH would be great alone because, in my opinion, it is the most beautiful building ever, more than any of the modulars released so far. All the four sides have at least some detail, so you can look at it from any angle and it will always be a nice building. It was meant to be alone. 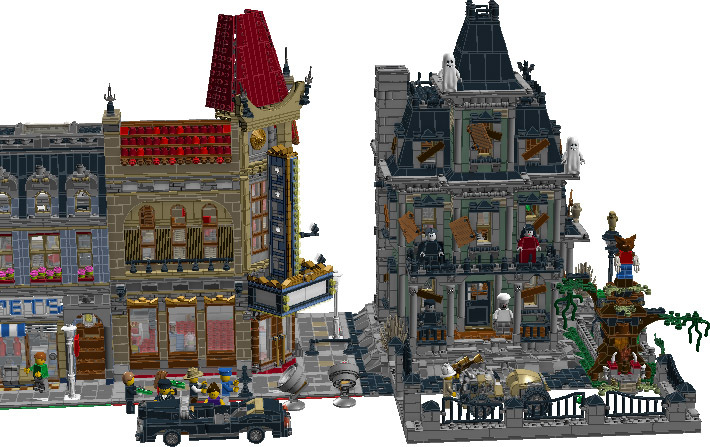 I just bought the Ghostbusters HQ and the Haunted House. I’m building the HQ first and will try I adapt its base (which is slightly different than regular Modulars) to the HH, so it keeps opening. Thanks for the ideas! Let me know how you get on with this. When I get round to rebuilding all my modulars and GBHQ, I want to try to get it to fit, and with the swinging open, it really doesn’t work. I was trying to see if I could build the floors more like the way modulars are, but using the same bricks as I have very few spares of the right colour. I’d just leave the fireman’s pole section as one tall piece.